Fall and Winter are trying to decide who gets to rule the weather over here at the moment and that means it's freezing one day and the next it's a nice 8 degrees Celsius with the sun shining brightly. Today it's raining, the wind is blowing and the weather forecast calls for just a little storm, yippee! So, what do I wear on a craptastic day like today? 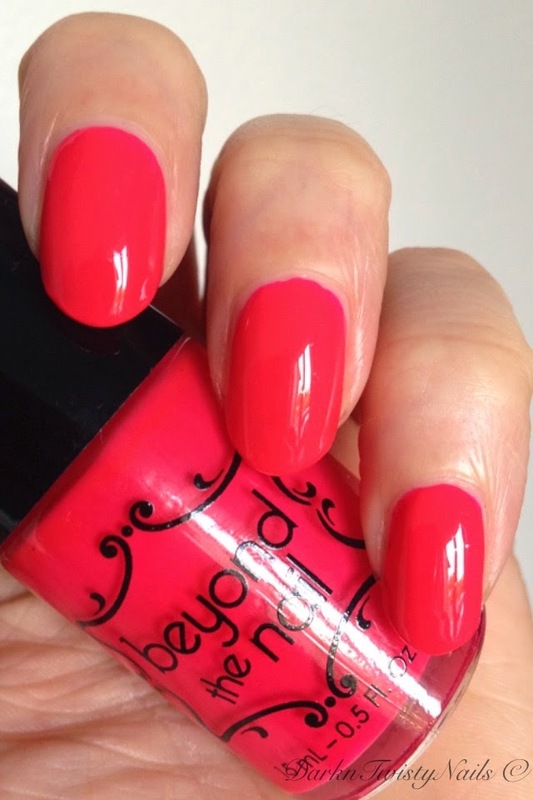 Well, a bright, in your face almost neon polish of course! 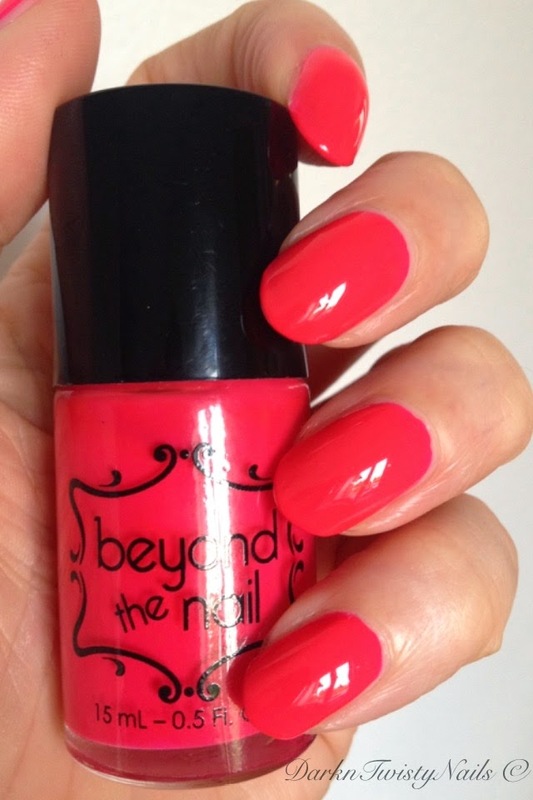 Beyond the nail Neon Magenta is a bright raspberry pinkish red polish. Although it's called neon and magenta, I don't think it's either one to be honest. It is extremely bright and very close to a neon but it's just not quite there and it's not magenta either... well, not what I call magenta. In my book, magenta is that shade of pink with a lot of purple mixed in and this is more pink with a lot of red mixed in. I might have my colors mixed up, so correct me if I'm wrong! 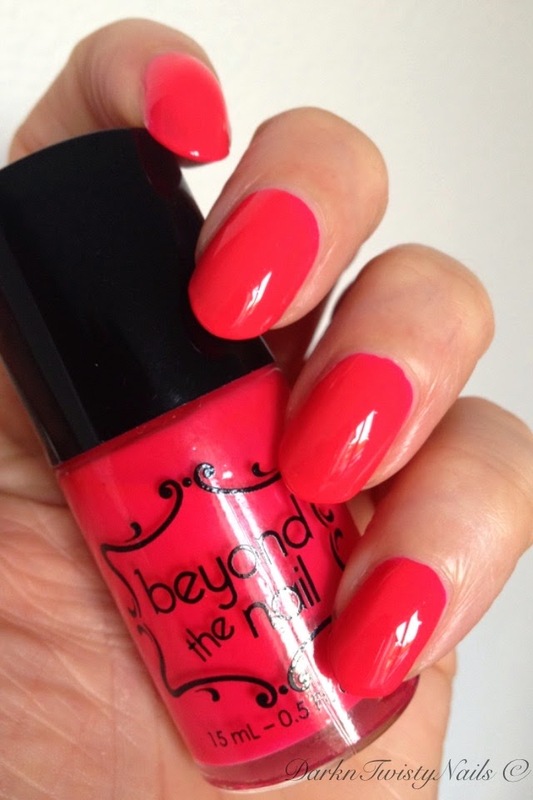 The formula is really nice, it flows on the nail with ease and it's opaque in 2 thin coats. If you're in a hurry and do a thicker coat, you might be able to get away with just a single coat! Even though I don't classify this as a true neon, it does dry as one, fast and matte. I added a layer of top coat to give it a glossy finish in my swatches. I love these kind of colors, especially in Spring and Summer. This time of year, I tend to wear all my dark n twisty polishes, but every so often, I feel the need to shake things up and go for a bright. This did the job perfectly! 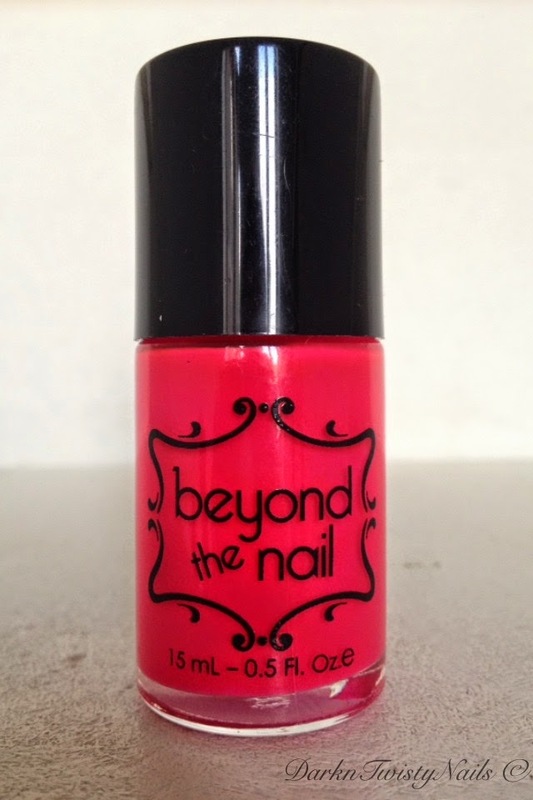 Beyond the nail is available on their Etsy page and besides doing great polishes, they also have a large selection of nail art supplies. I especially love their nial guides and vinyls. They have such a large variety of them, including snowflakes, snowman and holly vinyls that are perfect for the holiday season! Were you familiar with this brand and am I the only one who throws in a bit of brightness in all the sultry darks or do you do the same? Oh wat een heerlijk kleurtje! Om vrolijk van te worden!